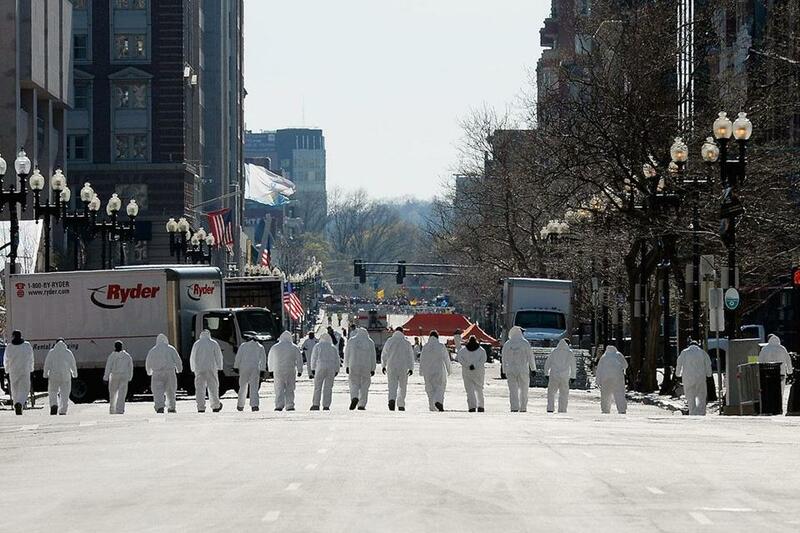 Looking for evidence in last Monday’s bombings, law enforcement investigators walked the route of the Boston Marathon on Boylston Street Sunday. Tamerlan Tsarnaev, one of the brothers accused of bombing the Boston Marathon, angrily disrupted a January talk at a Cambridge mosque when a speaker compared the Prophet Mohammed and the peace activist Martin Luther King Jr., the second time in recent months that Tsarnaev’s radical theology collided with mainstream Muslim faith at a public religious talk. In the days since the suspects were identified last week, a picture has emerged of 26-year-old Tamerlan Tsarnaev — the elder of the two brothers, who was killed Friday in the battle with police — as an increasingly militant immigrant, whom family members described as unhappy and mean. New details on the brothers’ fight with police suggests Tamerlan was killed when his brother ran him over, dragging Tamerlan underneath his car in his bid to escape. In disrupting the talk in January at the Islamic Society of Boston mosque in Cambridge, Tamerlan Tsarnaev’s shouted at a speaker: “You are a Kafir” – a nonbeliever, according to Yusufi Vali, a spokesman for the mosque. Tsarnaev went on to say the speaker was contaminating people’s minds, and accused him of being a hypocrite. The congressional panel wants all information related to Tamerlan Tsarnaev, who was interviewed by the FBI two years ago but not deemed a threat. The congregation disagreed, according to Vali, and “shouted him out of the mosque” on Prospect Street. Tsarnaev also interrupted a talk last November when a speaker said it was fine for people to celebrate holidays such as Thanksgiving and July 4, in the same way you celebrate the birthday of the Prophet. 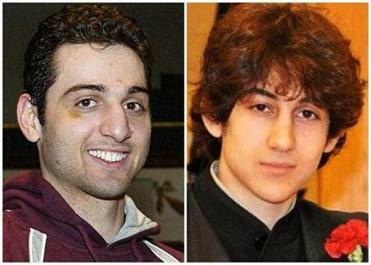 Tsarnaev challenged him and the two talked after service. “The brother was angry, but he left,’’ Vali said. Authorities believe the Tsarnaev brothers planted two crude bombs made from pressure cookers near the finish line of the Boston Marathon last Monday, killing three and wounding more than 170. Fifty-two victims remained hospitalized Sunday at Boston hospitals; four were in critical condition. On Sunday, as government and law enforcement officials appeared on talk shows, the victims of the attacks were mourned in churches around the region, as pastors and priests tried to help people understand the week of violent mayhem. Residents and businesses near the sites of the bomb blasts in the Back Bay remained barred from their buildings, but the city laid out a timeframe for their return, possibly within the next two days. School districts around the region prepared for students to return to classes on Monday, and to help them confront any questions or fears they might have, while the family of Krystle Campbell, who was killed in the blast, prepared to bury their daughter. Boston Police Commissioner Edward Davis said Sunday that federal authorities are trying to trace the origin of the firearms and explosive devices used by the suspects. “We hope to try to find out exactly where they obtained” the arsenal, he said. On NBC’s “Meet the Press,’’ Patrick said surveillance video showed Dzhokhar Tsarnaev dropping a backpack, believed to have contained a bomb, and walking away shortly before the second of two explosions, 12 seconds apart, boomed on Boylston Street. The new details on the bombing come as lawmakers in Washington, including Senator Lindsey Graham, a Republican of South Carolina, are turning up the heat on the FBI over the bureau’s handling of Tamerlan Tsarnaev, whom the department investigated and interviewed in 2011 after Russian authorities suggested he may have links to radical groups. The FBI did not find any evidence he was involved in terrorism. Tamerlan Tsarnaev was not a member of a local mosque, but began attending infrequently about a year ago, Vali said. His brother also attended. Two days after Watertown became the site of a massive gunfight and manhunt, the police chief, Ed Deveau, gave the Globe a dramatic account of the 20 hours his community was under siege. He said that Tamerlan Tsarnaev was alive and struggling with Watertown police early Friday morning, when his younger brother drove over him in a stolen SUV, dragging him on the pavement and apparently inflicting the injuries that killed him. The state medical examiner has not released an autopsy report detailing cause of death. The chief said that after the brothers allegedly carjacked a vehicle in Cambridge, they let the driver out unharmed. But the driver’s cellphone was still in his car, said Deveau. Police “pinged” the phone to determine where it was, he said, which alerted police that the suspects were in Watertown. A local officer spotted the brothers driving in two cars, a Honda sedan and the stolen SUV, said Deveau. The brothers stopped, jumped out, and started firing on the officer, while more police rushed to the scene. “Quickly we had six Watertown police officers and two bad guys in a gunfight,” Deveau said. At least 200 shots were fired; maybe as many as 300, he said. Deveau said the brothers hurled something at the officers — apparently a pressure cooker bomb — and there was a tremendous explosion. Police later found the lid to a pressure cooker. “We believe it was an exact duplicate of the Boston Marathon bombs,” he said. The suspects also threw five “crude grenades” at officers; three of which exploded, he said. One of his officers put his cruiser into gear and jumped out of it, letting it roll at the suspects to draw fire, he said. The suspects peppered the car with bullets. After several minutes of fighting, Tamerlan moved toward the officers, firing his gun until he appeared to run out of bullets, Deveau said. Officers tackled him and were trying to handcuff him, when the stolen SUV came roaring at them, the younger brother at the wheel. The officers scattered and the SUV plowed over Tamerlan Tsarnaev, who was dragged briefly under the car, he said. Dzhokhar Tsarnaev abandoned the SUV almost immediately and fled on foot, triggering an all-day manhunt. Meanwhile, officers at the scene treated MBTA transit officer Richard H. Donohue Jr., who had arrived on the scene and was wounded in the gunfight. He was in critical but stable condition Sunday. Police searched the abandoned Civic with a robot, apparently looking for explosives, said Aske. In the chaos of the shootout in Watertown, a state trooper fired at a passing Boston police unmarked SUV, according to two people familiar with the incident. No one was hurt when the trooper, apparently thinking the vehicle was the one stolen by the suspects, fired multiple rounds at the car, blowing out the back window. On Sunday, the scene of the shootout on Dexter Avenue and Laurel Street had become a neighborhood attraction, drawing onlookers with cameras. Houses were freckled with apparent bullet holes. The pavement was scorched with blast marks. Windows had been shot out of cars and beads of glass littered the ground.